Appearance: Large, though not the largest of Heshima, powerful even when he moves. Has a very hefty presence, even with his dual colored eyes and the thick, heavy black mask that surrounds them. His fur is a lighter gray than normal, fading to black near his spine and mine. Personality: Despite his intensely severe migraines and spouts of dizziness, this Heshima is nothing to underestimate. He is a just leader, though he rarely takes any concern for others and is very superior to all the rest. There is no way to escape his power, for he is known for his endurance and his ability to always remain number one. Appearance: Slender form, not well muscled. She has a long muzzle with pointed ears. Her base coat is a startling milky white, with a miasma of shades of gray mottled upon her coat. Dark gray marks the top of her nose and reaches up to her eyes, which are a nice soft amber. Personality: Loyal and faithful to a T. This female will do everything within her power to provide for her Clan and, maybe eventually, her bond. Seeming to adapt quickly to the effects of the potion in the bowl, this female functions just as well as any other without her hearing. She relies on reading body language and the vibrations under her paws to tell her what's going on. She's about the same size as her techno geek sister, but doesn't have the same build. In fact she's a might more lightly built female, and you might even say that she looks somewhat anorexic as you can see some or the ribs through the fur on her sides. She'll always be this way, even when you try to give her extra food to fatten her up a bit, as there is something about her metabolism that makes it near impossible for her to gain any kind of fat or muscle mass at all. Like her sister she's an intellectual female, and enjoys examining things. But her interest takes a more passive route as she'd rather sit back and examine things rather then get her paws dirty, and once the examination is done she'll point out the more interesting parts of that object. If she had a voice she'd tell people exactly what about that object is most interesting, and what she thinks each part does … but she doesn't and so she'll often go through an elaborate game of charades just to point these things out to her bonded. This is where she can get easily frustrated as she has so much to share, but is limited by what her body can do. Small, scraggly, and sickly, it is impossible to mistake this Njaa for anything else. It is not just his ribs that are evident from his skeleton; every sharp joint juts out beneath his loose skin, which fits him like clothes his parents bought him and told him he would grow into and he never did. A short but dense layer of sand tan fuzz covers his body, surprisingly soft to touch on the extremely rare occasion that it's clean and not matted with blood, drool, mud, or any manner of unpleasant things. The exception is the slightly thicker and longer fur forming a very slight furry mane down his neck. Scrawled over the body of fuzz are haphazard and slightly blurred dark stripes (save the stripes around his sunken inward belly, which are the classic grey, only fading to black-brown at the very ends), the nearly black color of dirty oil, a splash of which coats his muzzle and throat, and is more lightly painted on his ears, which are large and torn up around the edges. Along with the squiggly stripes, scars where his fur never grew back are scattered around his skin, and somehow he almost always seems to have fresh wounds when he is seen. Such is the life of the lowliest. Yet somehow, he has avoided the craziness that can frequently befall his kind. There are reasons that even for a Njaa he looks beat up an exceptionally skeletal; he is soft in heart; cowardly, groveling, submissive, skittish, just to start; and caring is not an advantage. It has made his life in the wild extremely difficult. However, it has also made him extremely susceptible to kindness, and for feeding his poor unfortunate soul, he has immediately grown attached to T'Rae, growling in an almost crooning way when he visits her — for he never stays for long. 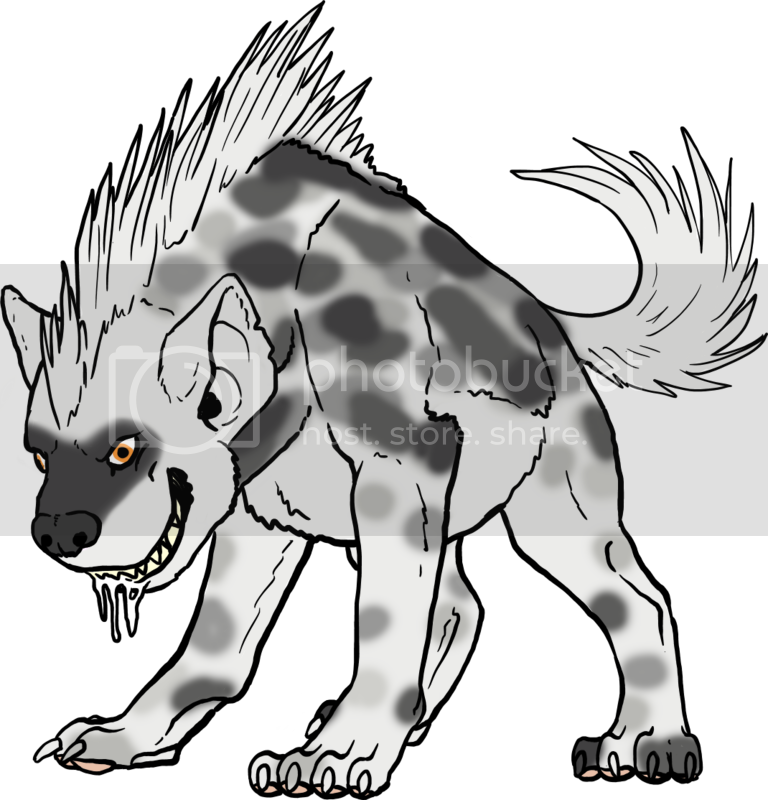 He is as much a stray dog as he is hyena, refusing to stay in one place long, but always returning when his luck runs out as it always does for the unlucky trodden sod. If T'Rae can put up with the ugliness of his wrinkly face, the danger of having a practically feral Fisi on her property, the stench of rotten death all around this scavenger of corpses to stave off his hunger; if T'Rae can tolerate the nasty side of him, she will find him extremely affectionate and steadfastly protective because of his gratitude for being allowed to survive another day.